While cruise companies seem to be vying with one another to introduce larger and larger ships with the latest technology in entertainment and facilities, it is comforting for many of us to know that the smaller, friendly ships still ply the seas, including Royal Caribbean’s Vision of the Seas, which this season home ports from Barcelona. 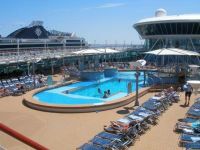 The cruise departing 21 June visited the French Riviera and then around the Italian coastline calling at Villefranche, Livorno, Civitavecchia (Rome), Salerno, an over night in wonderful Venice, finally Montenegro and then two days at sea to sun tan and end the holiday. Alternative routes in the summer include Greece, Greek Islands and Turkey. 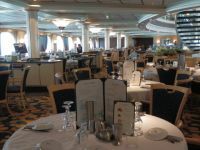 The ship was built in France in 1998 but had a US$50m refurbishment in 2013, to include new speciality restaurants, a lounge for Loyalty guests, extra Ocean View Staterooms, new carpeting and technology to allow aerial acrobatic routines from Deck 8 of the Centrum. First impressions as one steps aboard is, perhaps unsurprisingly, that it is very American. In spite of the obvious attraction of Barcelona as a convenient departure point for Europeans, half of the 2,320 passengers of all ages were from the States. The irrepressible zest of the American culture starts here with the welcome, the Centrum crowded with stands offering food and beverage packages and the like before one can reach one's cabin and settle in. One cannot fault the staff from over 50 countries (mostly the Philippines) for their friendliness and helpful attitude, almost overwhelming. 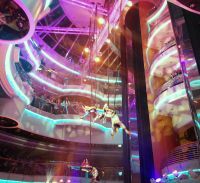 The hub of the ship is this Centrum, an open atrium stretching upwards from Deck 4 to 8. It is used extensively for musical entertainment, dance classes, game shows etc so it does mean that the noise rises and can sometimes interfere with other services such as the Guest and Excursion Desks, Shops, Internet Café and Book Nook (just a small bookcase). Vision class ships are designed in this way with no dedicated rooms for libraries and computers. 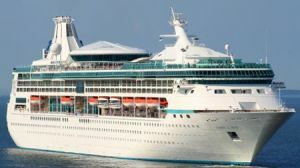 Internet is available but very expensive (US$39.95 for 24 hours or US$240 for the 12 day cruise – consequently not over used). The Centrum is also the setting for the aerial displays. The second of these in costumes of the Commedia dell’arte was quite spectacular. Another evening, with fellow officers, our Polish Captain Marek gave us some vocal entertainment, showing that if he lost the day job, he had a back-up career – not that he was the one who captained the ship when it docked with the stabilisers out – now an item added to their check list. 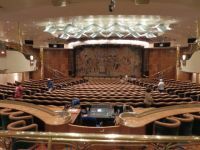 Shows are twice nightly in the very comfortable two-tiered theatre, provided mainly by RCCL’s resident singers and dancers with two or three guest artists – not to our taste, encouraging audience vocal participation and as usual these days far too loud. The large Casino also seemed very popular and throughout the ship the numerous bars and lounges provided ample seating. It was possible to find some tranquillity in lounges on the upper decks with quiet piano music in the evenings. The pool and outside area is not huge, although adults can also use the small Solarium pool. There is a large outdoor screen on the same deck, although the choice of films was very limited and mostly repeated several times throughout the cruise. For families, there is no dedicated pool for the children, but in Adventure Ocean for three to 11 year olds activities look a lot of fun and together with the nursery and Teens club, means all parents can spend time together day and evening. The Rock Climbing Wall can be used by children over six years as well as adults and other activities include a jogging track, table tennis and mini golf. There is a great emphasis on healthy living. For those who like to think of a cruise as an excuse for indulgence, it must be disappointing to see that food, particularly desserts, are fat free, sugar free, and gluten free and the Vitality Fitness Centre offers every imaginable treatment for all parts of the body, exercises, medical and beauty treatments. The Vitality Day Spa offers Steam and Sauna and all types of massage. The main dining room, Aquarius, has two sittings and offers a three-course menu from a wide range of dishes. On the first night quality and service was a little mediocre but improved as time went on, with some excellent dishes. The self-service Windjammers on Deck 9 has a vast range of food and drink and is the most popular for breakfast and lunch. The menus and wine list appears to cater mainly for the American market. For their European destinations, a few more local wines would have been appreciated. The British made up the largest group of the other passengers and this was acknowledged by such things as the English breakfast corner in the self-service restaurant and the English High Tea event in the main dining room, even though it was held at 14:30! The top speciality restaurant is Chef’s Table, intimate dining with a five-course gourmet meal and matching wines. 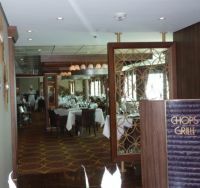 Chops Grille specialises in filet steaks and seafood and Izumi is an Asian Restaurant. Unlike the couple invited to Giovanni’s by the Casino Manager and turned up the next day saying they had searched Venice and not found the restaurant, we can assure you that Giovanni’s Table, a family friendly Italian trattoria specialising in traditional Tuscany dishes, is definitely on Deck 6. Excursions are extremely well organised and interesting and the companies RCCL has chosen provided excellent guides. One should be aware that in high season, queues for inside venues in places like Rome are so long that time does not allow for visits unless with a group. One expects excursions to be expensive but everyone was surprised at the cost of shuttle services into town, usually free. Local buses and trains proved a better option. The cruise was efficiently run and the rules of behaviour strictly adhered to. Cruise Compass, the daily newspaper, was very comprehensive and informative, as was the information in various languages on the cabin TV.